Wait, didn’t Paula’s Plate look different last time I was here? Did I come to the wrong site? What’s going on?? Also, a big THANK YOU to everyone who participated in the giveaway with my last post, and congratulations to Donna who won the exciting prize pack from Kraft!! Be sure to stay tuned for many more fun events and prizes in the future, woohoo! Alright, onto some delicious food. I knew I wanted to create something special for my entry, so I thought I would seek a little bit of advice. Now there is only one person I would turn to for help on this topic, and that is my good friend Holly over at Je Mange Toute la France. I wanted to know which classic French foods are often overlooked by American cooks, and being that Holly is an American who now lives in France, I knew she would have some great ideas. I was right. Holly offered several wonderful suggestions, and her final one, Fougasse, is what really caught my attention. What the heck is Fougasse? Well, Holly described it as a basic white bread that is often stuffed with herbs, olives and cheeses; I was immediately sold. I went to work brainstorming different combinations of flavors for this classic French bread from Provence, and I decided upon herbs de provence, sun-dried tomatoes, black olives and cream cheese. Yum! As usual, I prepared the dough in my bread machine, because then I can tackle other things while the machine does the work. That being said, you can certainly make the dough by hand or in your stand mixer with a dough hook, each option will work great and the results will be incredible. Now, if you read through the steps to making the recipe and you start thinking, “This seems like a lot of work for a loaf a bread…” I promise you, each step is very simple and every one is worth it. What’s my proof for such a strong statement? After Ryan took one bite of the bread, he asked if he could eat the whole loaf… I would say that’s a pretty promising review. 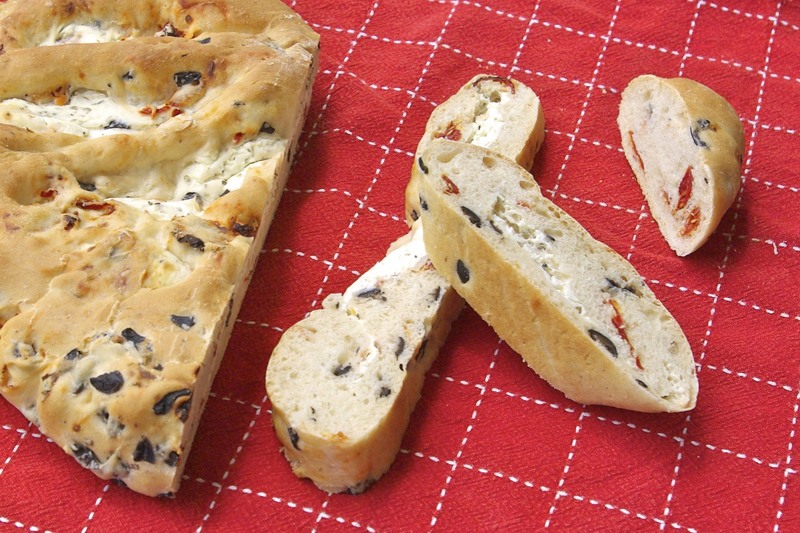 Savory, moist, and perfect for dunking in soups, this Fougasse is sure to please. 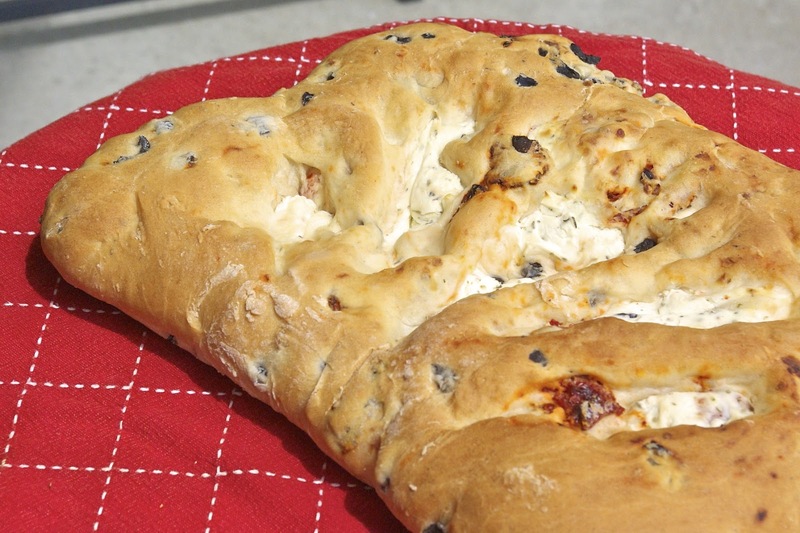 Paula’s tips: when you begin kneading the sun dried tomatoes and black olives into your dough,it will get very sticky. No worries, this is normal. Simply keep an extra bowl of flour near your work station and add in a little bit at a time until you have a nice pliable and soft dough. What is your favorite traditional French recipe? Let me know in the comments below! 1 cup water, 2 tbls. olive oil, 2 tsp. sugar, 3/4 tsp. salt, and 3 cups of bread flour. Make a small hole in the center of the flour and put 2 tsp. of yeast in the hole. Put your bread pan in the machine and run the dough setting. Prepare your cream cheese filling by incorporating 8 oz room temperature cream cheese with 1 tbls. herbs de provence in a small bowl until smooth. Lightly flour your work surface and knead your dough a few times. 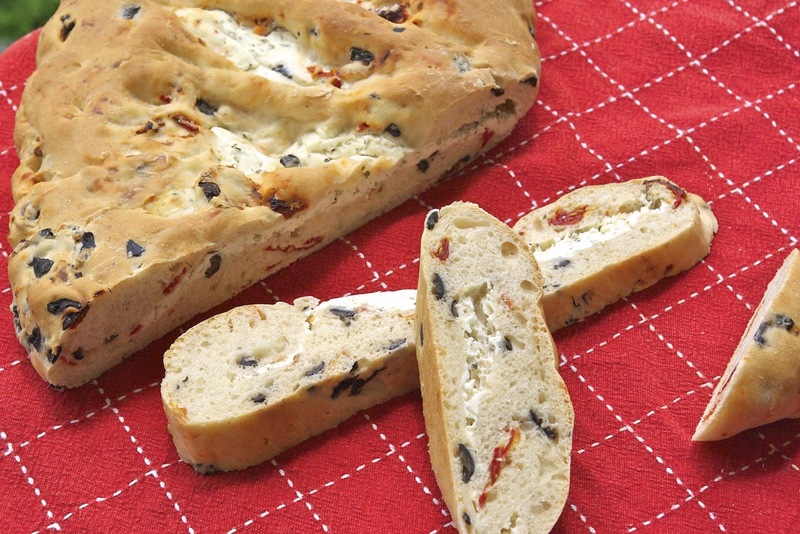 Incorporate 1/2 cup diced sun dried tomatoes to the bread dough, adding flour as necessary to create soft pliable dough. Incorporate 1/2 cup sliced olives to the bread dough, adding additional flour as necessary to create soft pliable dough. Using a rolling pin or your hands, flatten bread dough to a large rectangle. Transfer bread dough to a parchment lined baking sheet. Using the back of a spoon or a knife, spread cream cheese filling evenly over half of the rectangle, leaving 1/2 inch border. Fold rectangle in half, and pinch around the edges to seal. Using a sharp paring knife, cut 5-6 slits through the top layer of the dough, and use your fingers to slightly separate each cut. Cover loaf with a clean kitchen towel and let rest for about 20-30 minutes. Place bread dough in oven for a total of 20 minutes, rotating 180 degrees after 10 minutes. The fougasse looks excellent as does the new blog. Glad Ryan liked it as well. Fresh French bread is always my favorite, especially with a strong cheese and a glass of red. Thanks Holly! I agree, I love any fresh bread right out of the oven. I always cut of both ends right away and eat them up when they're still hot.